A self-contained cottage adjacent to an area of outstanding natural beauty, but within level walking distance of Blandford Forum, with many restaurants/bars and shops. Ideal base for the Jurassic coast and North and West Dorset. Built in the owners garden, it includes a kitchen, dining/garden room with vaulted ceiling,sitting room,double bedroom and modern shower room. There is a small outside sitting area. We have lived in the area for 25 years, my wife was brought up in the area. We bought the property about 20 years ago and have spent years renovating the main house and the cottage. The rural aspect and closeness to town attracted us initially. We live next door, and are on hand to help if need be, but will give you privacy to enjoy your holiday.A car is not required for daily needs, but is recommended to explore further afield. Double settee, chair, small tables, TV, DVD, freesat, wall fire. Notes on accommodation: Sorry, No Smoking, small well behaved dogs welcome, suitable for children ( notice required).Welcome pack is provided. We live next door and will do our best to help, if necessary. Outside: Small sitting area outside, with benches and outdoor eating area. Cleaning / Towels / Linen / Maid service: Towels and Linen are included and changed weekly.The property is cleaned fully at changeover. Other: Dining Room.Dining table 2 chairs, bookcase, double sofabed. Cosy, immaculately clean cottage in great location. Jane and Roger were very welcoming. Bread, milk, butter, biscuits and wine upon arrival. They also had thought if our dog with bags and treats left along with a towel. Very much appreciated. The cottage is within easy 5 min walk to town centre when there are plenty of pubs that take dog a also. Lovely walks nearby. The cottage is well equipped if you wish to self cater. All in all a great find for a quick away! We stayed in April cottage for 3 nights with our 18 month old daughter. Upon arrival we were welcomed by Jane and Roger, who kindly showed us around. They were extremely approachable but left us to get on at the same time. They had kindly left a welcome pack of fresh bread, butter, milk, biscuits, jam and wine which was very thoughtful. We spent the days out and then we came back and cooked in the evenings and it was perfect for what we wanted. I would definitely recommend as a great place to stay. It was s wonderful family break! Thank you Jane and Roger! 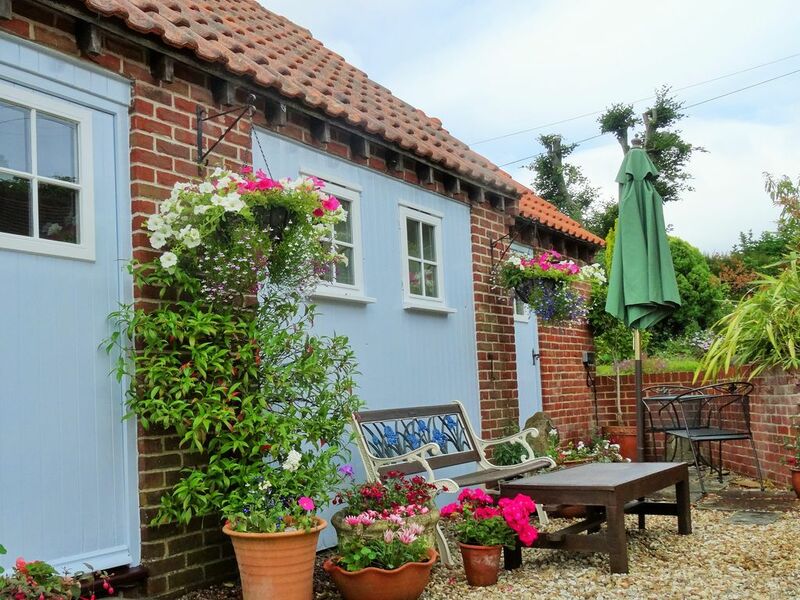 What a wonderful cottage - fully equipped with everything you could possibly need for a relaxing holiday. We were met upon arrival by the lovely owners who showed us around. There were welcome gifts of crusty bread and butter, a jar of homemade marmalade, a packet of biscuits and a bottle of wine. There were even treats for our two little dogs. Our holiday was perfect for us to recharge our batteries. We came and went as we pleased. Had some very enjoyable days and meals out. On other nights we stayed at home relaxing having cooked a meal in the fully equipped kitchen. I have no reservations in totally recommending April Cottage for a holiday. We will definitely be back. Lovely cottage great location thank you for a perfect stay ! Lovely cottage located in a quiet area but within walking distance to all amenities, shops , supermarkets, pubs and restaurants. The cottage was exceptionally clean and very comfortable with everything you require for a perfect stay . There is also access to a summerhouse and lovely garden which is a real bonus , We shall definately be returning . Ideal little cottage, everything needed for a comfortable stay for 2 people. Blandford is a lovely town, good shops plenty of coffee shops and supermarket within walking distance. Bus to Poole easy and lots to see there. April Cottage is perfect in every single way, fresh, clean, comfortable and tastefully decorated. We had a great stay and were made very welcome by Jane and Roger. We used the local shops for a bit of self catering and it was an easy walk to pubs and eateries. We made good use of the pretty garden room for sundowners. After we left I realised I had left my earrings in the bedroom and Jane kindly looked after them and posted them to me. Dorset coast is within 30 minutes by car. There are numerous shops, including 3 supermarkets within walking distance. This is the home of Badger Beer and there are many pubs and cafes in town, and a "local" around the corner. Blandford has many restaurants and takaways, and banks. Booking Notes: 25% deposit at time of booking with the balance paid in full 6 weeks prior to your stay. £100 breakage deposit is required when the balance is paid, returned in full after your stay. Changeover Day: Changeover is Saturday, but we can be flexible, subject to availability. Notes on prices: Shorter Breaks are available. All services are included.